Lauras All Made Up | UK Beauty, Fashion + Lifestyle Blog: Christmas Party Pack From Pebble Grey Ft. LED Cosmetic Mirror + Giveaway! Christmas Party Pack From Pebble Grey Ft. LED Cosmetic Mirror + Giveaway! 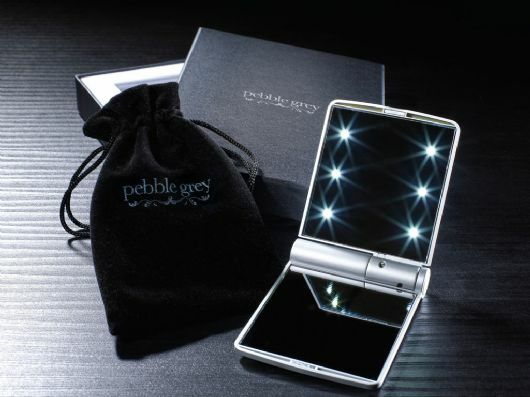 The compact LED lit mirror comes beautifully packaged in its own black velvet pouch, and housed inside an embellished Pebble Grey gift box. Because of the packaging and presentation, this mirror would make a great gift for the beauty lovers in your life? Or even a little treat for yourself! Not only is it elegant, but its also very practical. A must-have for the upcoming party seasons for those late night parties! In the pack I received these two lovely nail polishes, the first one is Calvin Klein Red Red, which is a beautiful bold, true red shade, perfect for this season! The second is OPI Over The Taupe, a neutral brown-y beige shade, great for every day wear. I also received these cute Sally Hansen Angled Tweezers, these couldn't have come at a better time because my previous tweezers have gone a bit blunt! I absolutely love these two Calvin Klein Single Eyeshadows, they are perfect for both every day wear and also to highlight and add shimmer to a party look! Finally, I got this lip and eye highlighter by Opupa, its perfect for highlighting underneath your brows and could also be used to highlight the upper cheekbone to give you a radiant glow. Last but certainly not least, a Burts Bee's Lip Shimmer in shade Champagne, which gives a light translucent pink toned shimmer to the lips, and smells gorgeous! Overall I am super happy with everything I received, so a big thank you to Emma and Pebble Grey for choosing me as one of the lucky bloggers to take part in this. As promised, I have one of these LED Mirrors to give away to one lucky reader! Please enter using the Rafflecopter widget below. There are plenty of ways you can gain extra entries!